Carbon is an essential building block for all living things on Earth, and carbon-containing compounds in the ocean and atmosphere control ocean acidity and global climate. Scientists from the University of Alberta, United State Geological Survey, Northwest Territories Geological Survey, and University of Texas Marine Science Institute released a study last week showing that the amount of carbon transported to the ocean by the Mackenzie River, which drains the second largest watershed in North America, has increased substantially over the past 40 years. This includes a 39% increase in dissolved organic carbon transport that may be linked to thawing of Arctic soils that have been frozen for thousands of years. The Mackenzie River watershed covers more than 1.8 million square kilometers of northwestern Canada, and by comparison is larger than the entire state of Alaska. In fact, this watershed is second in size only to the Mississippi watershed in North America, releasing some 790 billion gallons of water annually into the Arctic Ocean. The east channel is pictured here. Photo credit: Claire Griffin. “The Mackenzie River is the largest source of dissolved organic carbon to the Arctic Ocean on the North American continent. Some of this organic carbon is stored in the ocean, but a large portion is decomposed by marine organisms.” said collaborator Dr. James McClelland from the University of Texas Marine Science Institute in Port Aransas. 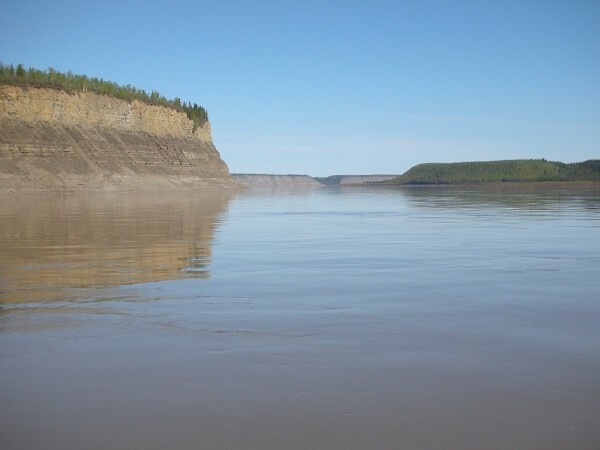 Much of the dissolved carbon that is transported by the Mackenzie River will ultimately be returned to the atmosphere as carbon dioxide, at time scales ranging from years to millennia. “The chemical composition of what’s going into the ocean affects the organisms living there and the food web structure. Organic carbon is a major food source for bacteria, so you might see changes in bacterial production and then that could go on to feed organisms higher in the food web” says the study’s lead author Suzanne Tank from the University of Alberta. Dissolved organic carbon in rivers primarily comes from plant material. Think tea. When you put tea leaves in water, the brown coloration comes from organic compounds that are drawn from the leaves into the water. A massive amount of plant material is trapped in perennially frozen soils (permafrost) in the Arctic, but rising summer air temperatures are causing permafrost to thaw and thus greater amounts of dissolved organic carbon to be released. This can happen slowly through gradual warming of soils, or catastrophically with landslide events where large sections of earth break off and collapse all at once. In addition, thaw-induced changes influence how water flows across landscapes and can cause carbon closer to the soil surface (non-permafrost carbon) to be transported in greater amounts to river networks. The research was conducted mainly using data records from Canadian governmental agencies, which included discharge data (the volume of water flow) and concentration data (its chemical composition). The data, gathered from locations throughout the Mackenzie watershed over four decades from 1972 to 2012, also show a 12% increase in dissolved inorganic carbon in addition to the 39% increase of dissolved organic carbon. This research was supported by Environment Canada, Natural Sciences and Engineering Research Council of Canada, Campus Alberta Innovates Program Chair, University of Alberta, and the US National Science Foundation. Excerpts from this story were provided by Kristy Condon with the University of Alberta.